Following his degree in Tokyo studying supramolecular complexes of achiral surfactant molecules with racemic and chiral aromatic guest molecules, Emmanuel travelled extensively. He has worked at the Ghana Atomic Energy Commission as Senior Scientific officer; at the Department of Chemistry in University of Ghana as Senior Lecturer; at the Department of Chemistry in Mississippi State University, Starkville; at the Department of Chemistry in University of Washington, Seattle; at the Chemistry Department in Sultan Qaboos University in the Sultanate of Oman; at the University of Nizwa, in Oman as an Assistant Professor of Chemistry, as well as studying at the Department of Crystallography in University of Pittsburgh and the Structural Chemistry Laboratory in University of Witwatersrand, South-Africa. 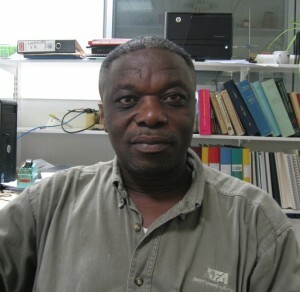 Since 2010, Emmanuel has been working at the Chemistry Department at the University of Cape Coast in Ghana as an Associate Professor and he is working hard to establish the first crystallography laboratory in Ghana to serve Ghana Scientific Institutions and those in the West-Africa sub-region. Emmanuel’s current research is centred on structural studies of self assembly structures that aggregate through O-H…N, N-H…O and O-H…O inter/intramolecular interactions, with special emphasis on those that possess functional molecular properties.